On normal meeting nights Scouts wear the top half of their uniform which means a green scout shirt, gold neckerchief and woggle. Any clean trainers and casual trousers can be worn. On formal occasions (e.g. parades) full uniform is worn. Black school shoes and either school trousers or blue Scout trousers. 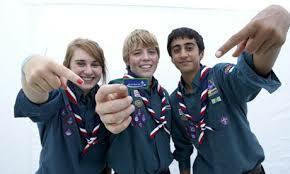 If you purchase from our local scout shop (1st Woodley) then the group receives ‘cashback’ which helps build our funds. The neckerchief is a recognition of the colours of our group and should be purchased from us. The appropriate group investiture badges and woggle will be supplied free of charge by the Pack when your child is invested.